Sativa Turner's personable labels are custom-designed to fit the accessories of your favorite Apple devices. Put a human face on your technology. All those stark white Apple accessories are easy to lose, easy to confuse. Now designer Sativa Turner's cool characters come to the rescue! These sly vinyl labels set your stuff apart: they're custom-designed to fit the accessories of your favorite devices, including iPhone, iPod, and iPad. You'll get 4 characters, each with precision die-cut labels for an adapter, a USB cord (both ends, of course), and earphones. The sturdy, UV-coated vinyl labels are easy to remove and reapply. And yes, the characters love to stick out their tongues while in use...it'll make you smile every time. Made in the San Francisco Bay Area. Each sticker set comes with 4 sticker sets, includes 1 set of each color pictured. Given as a gift to my sister's family with 4 teens. The power cords seem to disappear with everyone professing the one they have is theirs. So like sugar in water they just vanish. Very cool way to stop arguments about which charger belongs to each person in the home. I will buy again these covers for chargers. These will be used so our grandchildren can see which is theirs and not taking mine home with them. I will buy this product again for any new charger we get! 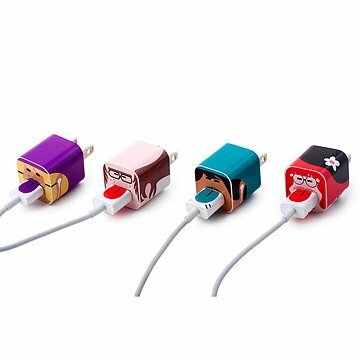 This is a super cute and creative product for identifying phone chargers for all ages. To identify phone chargers at a glance. Love having a fun way to keep my family's charger cords separate. Liked. Them so much I got them for a friend.